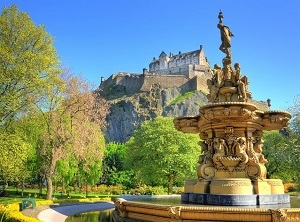 Edinburgh is a charming city full of architecture and history to delight culture vultures who enjoy sightseeing, discovering the history of a city through local guides, and admiring the breathtaking views. If you're a Royalist you'll be thrilled to know that you will be able to see not 1, but 2 places where the Royal Family have walked. The first is the famous Holyrood House Palace, the official Scottish residence of The Queen that is used primarily for state occasions. The 2nd is the Royal Brittania Yacht which the Queen and Prince Philip, along with the children, called home when sailing around the world. Known as being Europe's most haunted city so it's no wonder that Edinburgh's top attractions focus on ghost stories and recounting the grisly past of this historical city. Journey below The Royal Mile to discover Mary King's Close that lays below the city and learn why and how it's buried beneath the city. 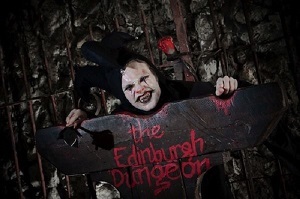 Get thrills and frights at Edinburgh Dungeon and take a midnight ride on a spooky black bus. Despite all the talk of ghosts, murders, and witches it's not all spooky because this is the city where JK Rowling was inspired for characters and places in the Harry Potter books - See what inspired Digaon Alley and where the inspiration for Hogwarts came from on a walking tour. It can be overwhelming to know what to see and do in this city that's overflowing with historic sites and attractions but don't despair as we've done the hard work for you to come up with the top 10 Edinburgh attractions. We have read the descriptions, scoured the reviews, compared ticket prices, and listed all of the information that you need to know so that you can make an informed decision on if this is a tour that is right for you. 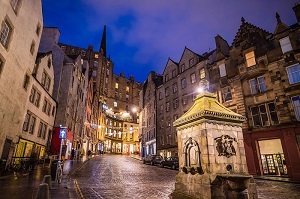 A ghostly guided walking tour of Edinburgh's Old Town. Move from street level down into the underground vaults. Learn Edinburgh's dark history from an English speaking guide and master storyteller. Walk the streets of Edinburgh on a ghostly guided tour. Listen to gruesome tales of torture and murder from your storyteller guide. 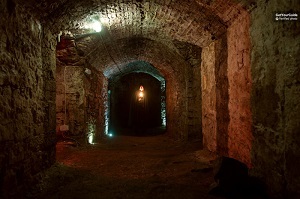 See a hidden side of Edinburgh as you move from the old cobbled streets down underground to the vaults. A 1 hour guided walking tour. Entrance to Edinburgh's underground vaults. The dark history of Edinburgh as told by an English-speaking guide. "A Very scary but enjoyable experience." "A great way to experience Edinburgh's history!" "A Fascinating tour by a fantastic tour guide"
If you love giving yourself a scare and enjoy horror stories, this is the tour for you. It's equally good for those who love history, especially dark history! This is a walking tour so you need to be reasonably fit. Tours are not suitable for under 5's and the night tours are for adults only. A 2 hour walking tour seeing the places that inspired J.K. Rowling to write Harry Potter. A must for true Harry Potter fans! Discover Edinburgh from a magical point of view. See the architecture that inspired Hogwarts and Diagon Alley. Visit the cafe where she wrote some of the Harry Potter books. Learn how Edinburgh's dark history inspired J.K. Rowling. Insight into JK Rowling's life in Edinburgh. "Awesome time exploring Edinburgh learning about Harry potter. Things were pointed out we would have never found by ourselves. A must for any potter fan "
"So knowledgeable and fun. My partner has never seen Harry Potter and even he enjoyed the tour!" "The HP tour was truly entertaining from beginning to end"
All Harry Potter bookworms, young or old, will enjoy this tour. Best for lover's of the books as the tour is about the author and where she found inspiration rather than the movies. Muggles will enjoy the tour of Edinburgh even if they have no idea about any of the Harry Potter storylines! 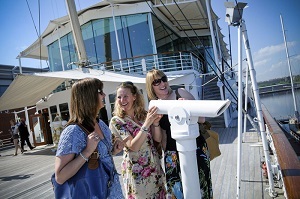 Fast track entry to the Royal Britannia Yacht – The floating Royal Palace! Learn the history of the ship in the visitor centre. Then step aboard and see what life was like onboard for the Royal Family as well as the crew. Learn the history of the ship through the handheld audio guide. See the State Drawing Room, the Queen's Bedroom, the Admiral's cabin and more. Go below deck to see the crews quarters and the engine room. Fast track entry to the visitor centre and yacht. Access to the Britannia's 5 decks. Handheld audio guide in 28 languages. "Fantastic tour - well set up and organised." "Excellent half day out, worth every penny of the admission fee"
"It was fabulous had a real feel for how the Royals relax and entertain"
If you take an interest in the Royal Family, you'll enjoy this tour! A good way to spend an enjoyable couple of hours on the coast. Fast track entry to Edinburgh Castle. Explore the Royal Palace and grounds including the Crown Jewels exhibition at your own pace. Admire the panoramic views of Edinburgh. Take a free 1 hour long guided tour of the castle. See where Mary Queen of Scots gave birth to her son. Fast track entry to the castle. Access to the on-site National War Museum.
" 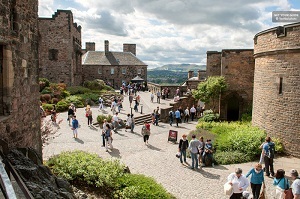 Edinburgh Castle is a ‘must-see attraction’ when visiting the city. I highly recommend to take a tour." "Certainly a must see, spent a good 3 hours here. The Scottish Crown Jewels and sword were awe inspiring and the views are breathtaking"
"It is really the heart of the city, you don't want to miss this experience, but be ready to spend half a day there, it is huge!" If you love history, royals, military, and sightseeing this is a ticket you don't want to miss out on! For for the whole family. This ticket does not include audio commentary and the guided tour is a first-come-first-served basis – If you want to get a comprehensive overview of Edinburgh castle a guided tour would be preferable rather than the standard entrance ticket. A hop-on-hop-off bus tour of Edinburgh with 14 stops. 24 hour / 1 day unlimited access. The modern open-top buses have Wi-Fi access and audio guides. Move around all the key sights of Edinburgh hopping on and off the bus at 14 stops. Audio commentary via headphones ensures you know the sights that you're passing. Enjoy the panoramic views from the open-top deck and make use of the onboard Wi-Fi to upload your photos to social media instantly! 1 day / 24 ticket with unlimited hop-on-hop-off access. Headphones and audio commentary in 8 languages. Map and onboard Wi-Fi access. "A wonderful way to see the highlights of the city." "Informative and good value for money"
If you have enjoyed hop-on-hop-off bus tours in other cities, Edinburgh's version will also please you. Great for people who are limited on time and want to move around the city with ease. Suitable for the whole family including disabled visitors. 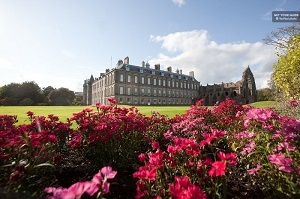 Holyrood House Palace is the official Scottish residence of Queen Elizabeth II. The grounds contain the iconic ruins of Holyrood Abbey. This entrance ticket includes an audio guide available in 9 languages. See the State Apartments where the Queen and the Royal Family stay when in Scotland on official matters..
See the historic chambers of Mary Queen of Scots'. See the iconic 12th century ruins of Holyrood Abbey and wander in the gardens. Entrance to Holyrood Abbey ruins. 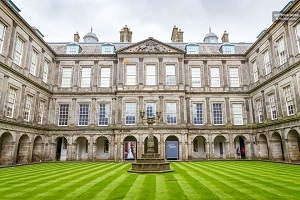 "I thoroughly enjoyed the tour around Holyrood Palace and found it very interesting. " "The palace is beautiful. The tour uses hand held recorders but there are many staff available to answer any questions you might have." "Beautiful castle, wonderful displays and ever-helpful and knowledgeable wardens." A must for those who love seeing inside 'real life' castles and palaces. Anyone with an interest in history and the Royal Family will enjoy this tour. Not suitable for photographers because photography is not permitted inside the palace rooms. A full day tour to see the beauty of Scotland's dramatic scenery. Visit Loch Ness, Urquhart Castle, and Glencoe. See small quaint villages plus iconic locations. Visit Loch Ness and take a cruise in search of Nessie, or explore the ruins of Urquhart Castle. 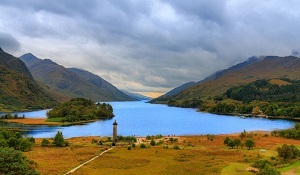 Visit Glen Coe, the site of the 1692 massacre of the Clan MacDonald. See Highland Cows, mountains, bogs, moors, hills, lochs, and more! Full day trip by coach with local driver/guide. Live commentary onboard the air-conditioned coach. "Great value and a wonderful sightseeing trip, would do it again"
" Loved the tour. The information provided by the tour guide was interesting and insightful"
"The trip was amazing, we really enjoyed it and we learnt tons of new things about Scotland"
A great way to see the countryside and experience more of Scotland than just Edinburgh. A good introduction for those who are short on time but want to see Loch Ness and other places. The price does not include food or entrance fees so do take this into consideration if you're on a budget. A thoroughly entertaining ghostly experience! Ghost stories galore to send shivers up your spine! Ride the only spooky black bus that survives from the Necropolis Bus Company. 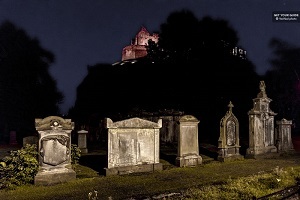 Learn about the grave robbers, plague victims, and ghosts of Edinburgh. Walk in the graveyards with your spooky storytelling conductor. Bus ride on a black vintage route master bus. "What an entertainment!!!! Loved it loved it loved it....So much fun and information at the same time. " " Mr Volvo was hysterical. Great tour. Enjoyable time"
"It was amazing, from the minute we stepped on the bus until the end!" If you want fun and laughter mixed with spine-tingling thrills, this is a tour for you. Good for those looking for an evening of fun. Not recommended for younger kids or those who hate horror stories! A walk-through historical experience with actors, special effects, scenes, shows, and rides. 2 fun & frightening underground rides. See, hear, touch, smell, and feel the dark side of Scotland's history. Walk through 11 interactive 360-degree shows as you uncover real-life ghost stories. Take a spooky boat ride into the lair of cannibal Sawney and scream with delight on the Drop Dead Drop Ride. Entrance to Edinburgh Dungeon experience. 11 interactive shows to walk through. "From beginning to end it was filled with tension, humour, frights, palpitations and nervous sweats!!" "A super experience for all, a must see and do when in Edinburgh." "We had a fantastic time, great history, spooky stories and the vaults were amazing!" A fun experience for those who love interactive tours and a fascination for horrible history. Not suitable for people with a nervous disposition. Not recommended for children under the age of 8 and not suitable for under 4's. Access to the 17th century subterranean streets located below The Royal Mile. A fully narrated history tour. Costumed characters help bring history to life. Visit the pre-tour exhibition room to get a basic understanding of what you're about to see. 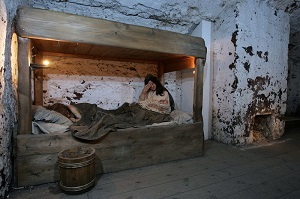 Then, with your tour guide and other members of your group, make your way below ground to Mary King's Close. See the warren of streets and spaces and learn about the people who lived here and how the lanes came to be underground. Entrance ticket to the Real Mary King's Close tour. Access to the pre-tour exhibition room and gift shop. Guided tour in English or Spanish with audio guides available in other languages. "Very interesting, especially for those who enjoy history." "A very entertaining and informative hour with a delightful blend of facts and humour. " " So much information and context, you really get a feel for what it was like in that time period." An interesting tour for those who like history and sightseeing, learning about a city's past. Not suitable for wheelchair users and those with mobility issues due to uneven surfaces, low-level lighting, and steps. Although this tour is not intentionally scary, some young kids might find it so due to the location. Edinburgh Castle is a big complex consisting of various museums that overlooks the Scottish capital. 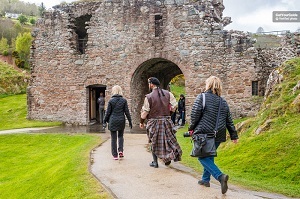 The tour reveals interesting historical facts about the historic castle. During the guided tour, visitors will see one of the smallest existing shrines and one the largest cannons they have ever seen. You will learn about the historical significance of the Edinburgh Castle and turbulent events related to the big complex. Admire views of the Scottish capital and its surrounding area. Benefit of the priority entry and visit exhibition venues displaying Scottish Crown Jewels, weapons and armor. A fast-track entry to the Edinburgh Castle. Assistance by a licensed and passionate tour guide. "Overall, the tour was paced well and covered the right amount of history/information..."
"I would definitely recommend this tour." "Fun tour with a great guide." Edinburgh Castle is a must-see attraction of the Scottish capital, and the guided tour offers insights most travelers are unaware of. Especially recommended to fans of history and warfare. The tour is suitable for children and adults alike. A convenient tourist pass allowing its holders to visit the most important royal attractions of the Scottish capital city. The ticket entitles its owners for a 2-day hop-on hop-off bus tour of Edinburgh. The 48-hour attraction ticket grants its holders to avoid waiting in lines at specified attractions. You will enjoy unlimited rides on the Edinburgh hop-on hop-off bus. Save time when visiting the Holyroodhouse Palace, Castle of Edinburgh and the Royal Yacht Britannia. With the price of the ticket, you pay less for enjoying the services and visiting the attractions than by doing so separately. Entrance to the Edinburgh Castle, Holyroodhouse Palace and the Britannia Royal Yacht. 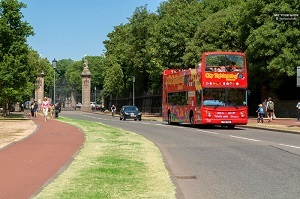 Unlimited rides on the Edinburgh sightseeing bus during the validity period. "We used all 3 bus routes which saves money and time." "This tour is a very good value." "Great package! Worth the money!" The package offers a great value for money to travelers interested to visit the top three royal attractions of the city. The ticket is very convenient for first-time visitors to Edinburgh and travelers curious about its past. The package saves travelers money and time. The tour is a journey through the picturesque Scottish countryside better known as the Highlands. Visitors travel to various points of the Harry Potter film series. The Hogwarts Express train traverses and takes passengers near some iconic places featured in the Harry Potter films. You will ride the Jacobite Steam Train, which most people know as the Hogwarts Express from the Harry Potter films. Visit multiple locations where filming of the popular TV series took place. Admire incredible landscapes of the Scottish Highlands, including hills, lakes and valleys. Train ride on board the Jacobite Steam Train, aka Hogwarts Express. Trip to Fort William by coach. "The trip is definitely worth the price." "A very long day, but it was an extremely thorough tour of the highlands." "The Jacobite steam train was something I will never forget..."
Taking the guided tour is the right activity for fans of the Harry Potter films. Admirers of amazing landscapes will enjoy the trip for sure. The tour is suitable for travelers of all ages. The tour introduces the history of Scotland, its amazing landscapes and one of the most famous Scottish exports - Whisky. Stirling Castle used to be a residence of the Scottish royals, while scenic Loch Lomond is the largest lake of Scotland. Glengoyne Distillery produces high-quality Whisky for around two centuries. Learn stories about famous heroes of Scotland, such as William Wallace and Robert the Bruce. Visit Loch Lomond, one of the most beautiful lakes in Scotland, from a vantage point. Taste extraordinary Scotch Whisky in Glengoyne Distillery. Round-trip transportation by a mini-coach. Pickups and drop-offs at selected points. "I had no idea we'd see so much in one day!" 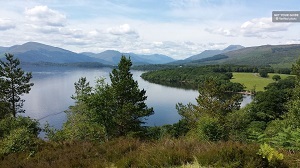 "Beautiful lochs and castles on an informative tour." The tour is highly recommended for fans of Scotland and its history. People fond of capturing amazing landscapes by camera shouldn't miss this tour. This is a must-do activity for travelers enjoying Scotch Whisky. An authentic Scottish experience involving different varieties of Whisky and traditional storytelling. 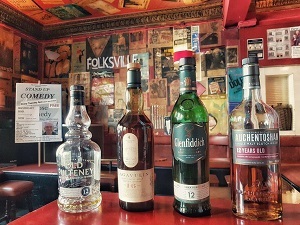 Presentation of whiskies from different parts of Scotland. An insightful tour spotlighting the significance of Whisky to the national identity of the Scots. Enjoy traditional Scottish storytelling while having a few glasses of Whisky. Distinguish the difference between lowland and highland whiskies. Drink four different types of Scotch Whisky. Interesting storytelling and four types of Whisky. "Our guide and storyteller is charming and honest." "My husband enjoyed the whiskey and we both had a great time." Join the activity to learn how best to appreciate Whisky. The activity is suitable for everyone appreciating great stories and authentic Scottish experiences. The tour is suitable for people not drinking alcohol since substitutions are available.